With the Roland TD-25KV, serious drummers can tap into high-end V-Drums playability in a mid-level kit for home and studio. Equipped with a sound engine derived from the flagship TD-30, the TD-25KV delivers all the acclaimed expressiveness that makes Roland's top-line V-Drums the undisputed choice of pro players everywhere. A streamlined interface makes it easy to create personalized kits, while the built-in audio recording function lets you capture drum performances for evaluation and sharing. Other premium features include mesh-head pads for a natural feel, positional snare sensing for enhanced expression, and the VH-11 V-Hi-Hat for playing with authentic hi-hat techniques. The TD-25KV delivers a superior drumming experience, thanks to Roland's SuperNATURAL technology with Behavior Modeling inherited from the flagship TD-30. The sound engine responds naturally and organically to your playing in every way, providing the dynamic, interactive feel that's essential for reaching the highest levels of musical expression. From rim shots, rolls, flams, and ghost notes on the snare to dramatic crash hits and sustained cymbal swells, every nuance is detailed, accurate, and ultra-smooth. When you sit down at the TD-25KV, you'll enjoy expressive playability that rivals high-end V-Drums sets. There's a full complement of mesh-head pads for the legendary V-Drums feel, with positional sensing on the snare pad that provides subtle, organic tonal changes depending on where the pad is struck. The cymbals have a natural swinging motion and support chokes, bow/edge sounds on crashes, and bow/edge/bell sounds on the ride. Mounting on a standard hi-hat stand, the VH-11 V-Hi-Hat features open/closed motion and bow/edge sounds for executing traditional playing techniques to perfection. Last but not least is the KD-9 Kick Pad, which offers a natural-feel cloth head and rock-solid response. Overall: I bought this kit to use both for practice and studio, but also to use live in my rock cover band. The kit arrives in two boxes, one for the rack and the other for everything else. It's pretty simple to set up. It takes a little while to get it just right though. The pads feel great! They are very responsive and realistic. It is really a joy to play! The module is very easy to navigate. Roland made it very easy to customize a kit just the way YOU want it to sound. The factory kits are pretty good. Some I really like and some not so much, but there is something for everyone I think. Just find one that is close to what you want, then customize it to get that perfect sound! I haven't used any of the training tools yet but they seem like they would be helpful. The ability to play along with a song is great! Plus you can select a section of song and loop it or slow it down until you can play it perfect! It is pretty quiet, with headphones I can play it in another room and my wife doesn't get disturbed and that's always a good thing!I like the rack. It folds together very compactly for easy transport. Then unfolds very quickly for reassembly. Great for live gigs.Here are the downsides I have found so far. It only has a mono or stereo out. (It also has midi but I haven't used that yet). So using it live could be a challenge. I have used it for a few live gigs so far and it was ok, but you really have to have the kit dialed in perfect from the start because the sound man has only volume control of the whole kit. He can't just turn up the kick or the snare. That could be a problem.Next issue, It seems to be a little particular about what brand thumb drive you use. I had one and it worked fine for saving different kits but it would stop recognizing the thumb drive when I tried to record. I used a different one and I haven't had a problem with it. So far I have used it for just a few live gigs and it has been great. I would definitely recommend this kit to both the new player and seasoned veteran like myself. Oh I almost forgot the great Zzounds payment plan! That's what made this purchase possible! Buy one on the payment plan! 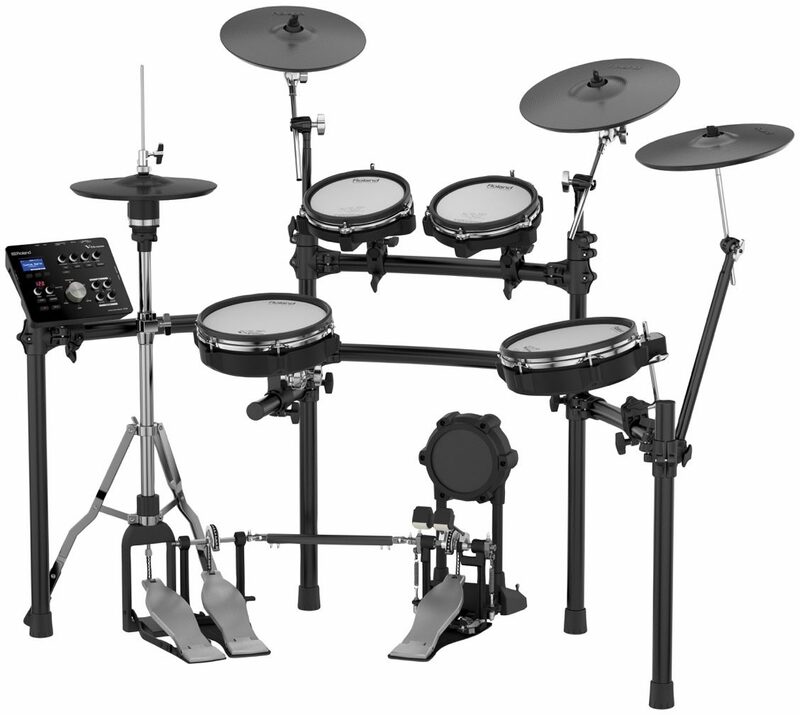 Overall: I purchased this kit to replace the Alesis DM10 Studio. It is a fantastic kit! I really love that they have the rack constructed already. It makes the total setup really fast. Right out of the box the kit is playable. With the Alesis I spent weeks getting it dialed in and it still was not fun to play. I upgraded the heads to mesh...and it still was not very playable. The TD-25KV V-Tour has been a blast to play! I superior kit to the Alesis. If you're trying to be cheap and save money by buying the Alesis...DON'T. The Roland is totally worth the investment.